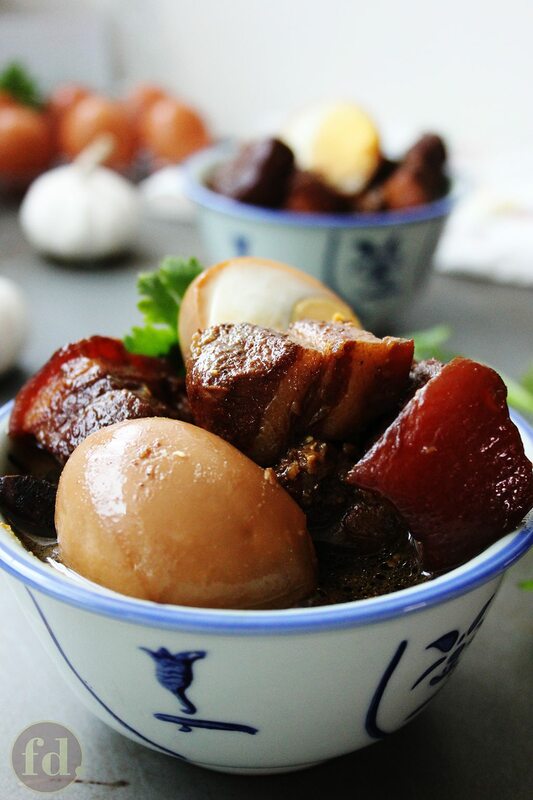 Taste the heartwarming goodness of Chinese comfort food with this simple dish of pork belly slices and whole-cooked eggs braised in flavoured soya sauce. This deliciously tender pork is best enjoyed spooned over steamed rice, drizzled over with its sauce, or with piping hot porridge, and as meat stuffing for plain buns. I have to admit that I am truly and utterly addicted to saucy foods. This probably started from the time I was a wee toddler, having been raised on Chinese and Peranakan meal staples like babi pongteh (Nonya braised pork in fermented soy bean sauce), chicken curry, braised chicken with potatoes, and that’s just naming a few true-blue Chinese classics. 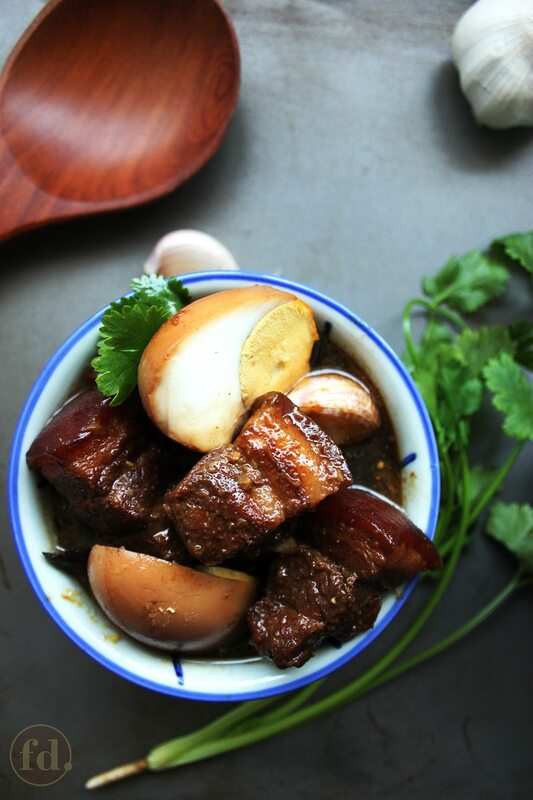 On our list of much beloved Chinese homecooked dishes, is this tenderlicious braised pork belly and eggs in soya sauce. Trust me when I say tenderlicious, I mean literally come-apart tender! This is possible with pork belly or very tender cuts of pork marbled with generous streaks of fat, and when braised long enough. The gentle braising process also tenderises the pork skin, turning it translucent and gelatinous, and deliciously soft like jelly. That’s not all! There’s also the smoky, earthy flavour of the sauce as lard (oils from pork fats) fuses with garlic, cinnamon, star anise, five-spice powder and soy sauces… it’s simply umami heaven! The sauce is reduced to a glaze-like consistency, intensifying layers of savoury, sweet, salty flavours – coating every inch, ounce and morsel of meat, and whatever you spoon it over. Can I make a confession though? I kind of make a little pool of that sauce in my Chinese dinner spoon, drown the pork chunks in it, and lap it up like soup. Do you do the same? I’d like to think that there’s absolutely nothing wrong with just taking it all in – to really appreciate this heartwarming dish is to savour it in its entirety! And I figured if I should feel inclined to eat more responsibly and get all health conscious, I find that it’s easy to pick away at the fatty layers, and dive into the leaner parts of the pork. There’s no doubt you’ll find many recipes on braised pork belly anywhere you look. It’s probably one of the most popular and treasured Chinese dishes we’ve inherited. 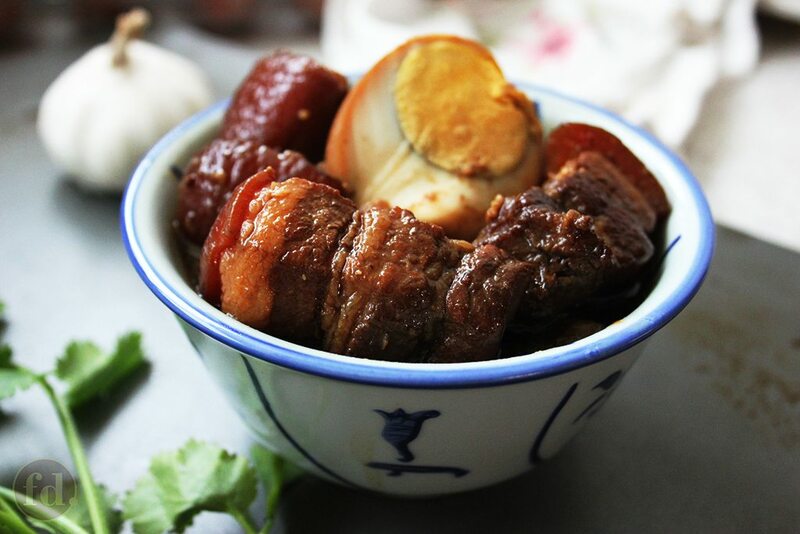 It remains a humble dish prepared with heartfelt love in many a Chinese kitchen, and uses incredibly simple ingredients. 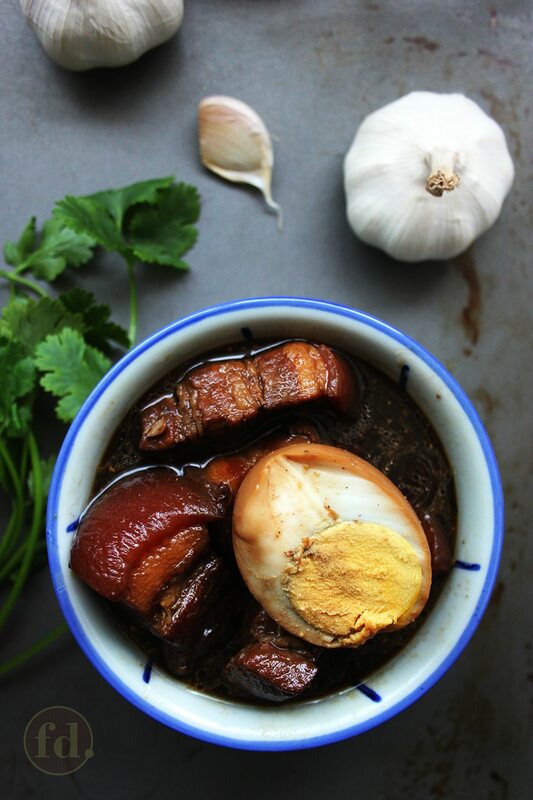 In it’s most basic version, braised pork belly and eggs can be easily prepared with just garlic, ginger, light and dark soy sauces, sugar and salt. The versions we’ve now come to enjoy have built upon this, infusing the flavour of the dish with local condiments and spices such as cinnamon, star anise, cardamon, five spice powder (a combination of ground cloves, cinnamon, fennel seeds, star anise and peppercorns ), as well as sesame oil and Chinese wine. 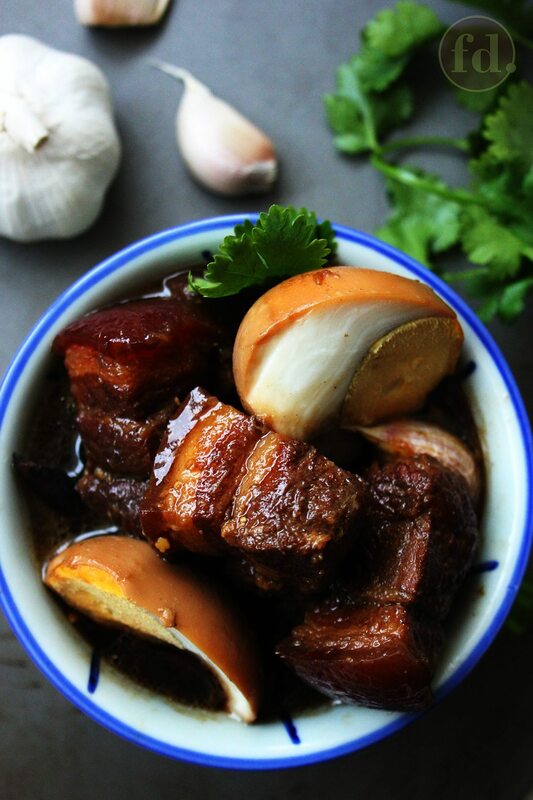 Are you beginning to get a sense of just how extremely delicious Chinese braised pork belly is? I sure hope so! Hope you’ll have a go at it, and don’t forget to share by tagging @foodelicacy or #foodelicacy. Slice pork belly into 2 x 5 cm (3/4 x 2-inch) pieces. Rinse garlic cloves, with peels left on, and crush lightly. Heat up a heavy-bottomed pot or pan (do not add oil) over medium heat until hot. Put in the pork slices and stir-fry for a few minutes. When the fat oozes out, grease the pot or pan with it by stirring the pork slices around the base. Add garlic cloves and toss for a few minutes or until fragrant. Reduce heat slightly, stir in the light soya sauce, thick dark soya sauce, sugar, salt, star anise and cinnamon bark. Stir-fry quickly to mix well until pork slices are evenly coated all over. Add in the five-spice powder and water. Bring to a boil. Reduce heat until braising sauce is gently simmering. Cover the pot or pan with a lid, and let simmer for 30 minutes. Add the eggs and continue to simmer for another 10 - 15 minutes, or until meat is tender (add a little hot water if braising sauce has reduced too quickly). Allow braising sauce to reduce to a glaze-like consistency, thick enough to coat the back of a spoon. As the braising sauce reduces, the flavours will intensify, so do a taste test. Add more sugar or salt, depending on whether you like the sauce more sweet or more salty. Best served hot with sauce, spooned over cooked rice, noodles or alongside porridge. This dish can be prepared with chicken. Frying the pork (or chicken) in a greaseless pot or pan reduces water content and accentuates the aroma of the dish. Hi Doris, sounds like you and I could have a pork belly feast together! Pork belly is my absolute favourite meat too, and I confess that wherever I see recipes that call for pork, I tend to use pork belly first unless it just doesn’t work well with the recipe, like minced pork patty, for example. Thank you for trying the recipes here! Your feedback is always so much appreciated! Thank you for this great recipe. It is so delicious that I have been making it and eating pork belly is my all time favourite meat. Plus I have a hobby of stocking up spices so the cinnamon bark, star anise and five-spice powder have been put to good use. I am making the pork belly again next week… yummy. Hi Celia. I’m Mayyap from M’sia. Happy to subscribed to your page. Hope to try all your recipes sooooon. They really look yummy ??? Hello, Mayyap! Thank you so much and a warm welcome to you!??? I’m so happy you found my blog too! Looking forward to us both sharing our cooking and baking experiences together on this site, ya? Hi Jen, this recipe is very versatile so I think you can make this with pork tenderloin, pork ribs, chicken or beef brisket, as long as the meat used can braise till tender for a more enjoyable experience. Hope this helps!? Hi, I’m not a fan of pork belly, too fatty for me, is there a substitute that you can recommend for meat?